View of the Church of St Giles in the Nottinghamshire village and parish of Edingley. This is a small church with no tower, only a bellcote. The north wall comprises a number of windows from different periods, including a narrow Norman one. The church underwent extensive repairs and restoration during the 19th century. 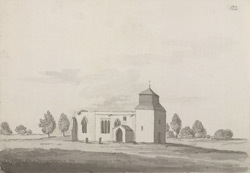 The chancel was rebuilt by Henry Machon in 1844.